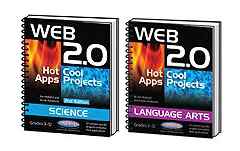 Beyond social networks, blogs and wikis, Web 2.0: Hot Applications and Cool Projects motivates and inspires students by using free web-based applications to instantly create and publish media-rich content directly to the web while keeping the focus on relevant curriculum. Using tools to build dynamic slide shows, digital scrapbooks, interactive flash books, instant web notes, animated avatars, and real-time collaboration, students evaluate, assimilate, and analyze language arts concepts using 21st-century skills. These free web applications transform the way students feel about language arts, giving them a channel for their creativity, and a voice in their own learning and discovery. Free web applications: nothing to install!